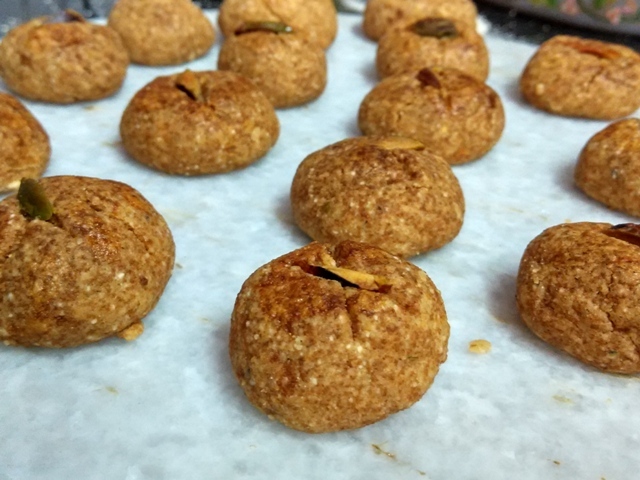 Besan nankhatai is a delicious blend of chickpea gluten free flour and butter. Yes, easy to dish out, this nankhatai recipe can be tried with or without oven. 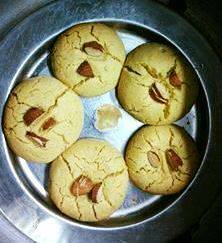 This besan nankhatai pic is from my archives - the first time I made this delicacy, that too in cooker and on gas stove. This is my first attempt at cookie making. It was just the time the baking bug had bitten me!!! I did not own a microwave until then and decided to buy after this successful attempt at cookie making. You may be surprised to know that I started my cookie baking journey with this batch. So this is special and I want to share this with you all. Now if you are wondering: is chickpea flour gluten free, then I would say yes it is! 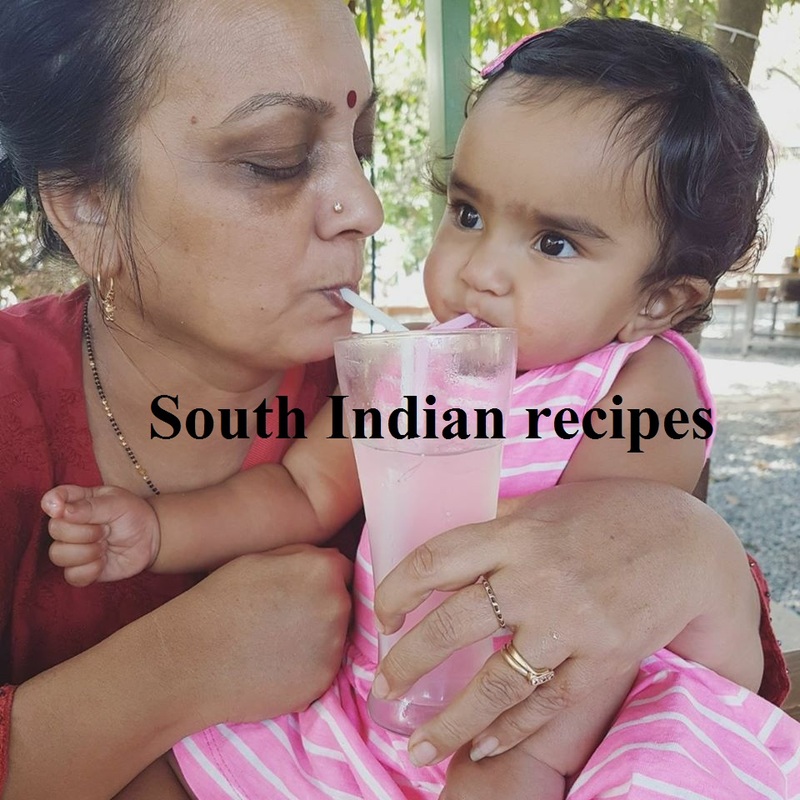 So you can enjoy this healthy batch of baked goodies dished out with a simple chickpea biscuit recipe, so anybody can try out and relish heaven in every bite. 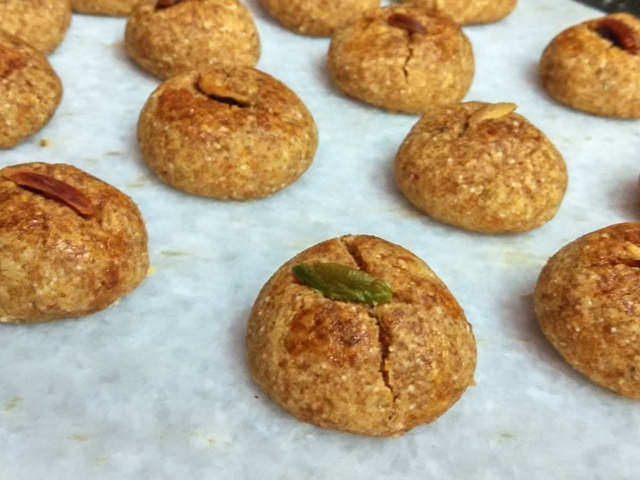 The word nankhatai and the look of these chickpea gluten free cookies sound so royal. It's been a personal favorite since childhood. 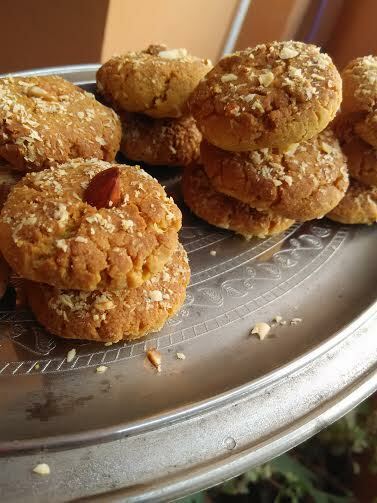 I loved visiting the local bakery in Patiala just to have these delicious chickpea flour cookies. Dad knew his daughter loved this set of cookies more than any other, and he would never forget to bring these for me. Now I want to bake this batch for him. 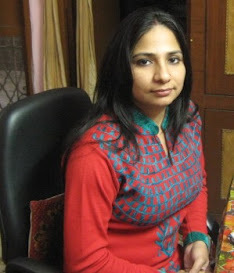 Will surely post besan nankhatai pics when I bake them for dad. He has already tasted a number of cookies baked by his daughter though and liked them. The Indian version of shortbread cookies are nutty, healthy, and yummy. The melt-in-mouth chickpea biscuits are a breeze to process and require a handful of ingredients that are easily available on your kitchen counter top. Now that the festival of lights is around the corner, would you mind baking a fresh batch of besan nankhatais to present these baked goodies as a Diwali gift to a loved one? Nothing like a freshly baked cookies!!! Sift besan, whole wheat flour, and semolina 4-5 times using a strainer. This will aerate the flours and make them lighter, giving them the expected rise without baking powder or any other raising agent. 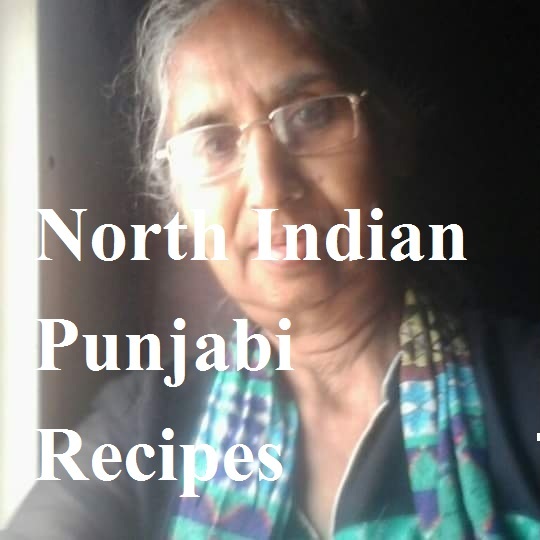 Next, take ghee in a bowl and whisk with a pinch of salt and jaggery powder. Whisk for a good amount of time -8-10 minutes until it looks light and fluffy. This is why we need solid ghee. Throw in cardamom powder and mix well. Gradually add the flour mix to the ghee. Collect the ingredients and try binding it into a dough. It might look a little difficult initially, but you can do it slowly and steadily. Once you are able to bind the dough, make small lemon-sized balls with it. Preheat the oven or microwave convection to 180 degrees for 8-10 minutes. Press the nankhatai balls lightly and make a cross sign on each cookie with a knife. Insert a nut into the cross sign. Place each cookie on the baking tray and follow the process with the remaining balls. Make sure there is a distance between each besan nankhatai. Do not clutter the tray. Else the cookies might not bake properly. They need adequate space for expansion. Bake the beauties for 18-20 minutes. Allow the atta nankhatais to cool down before munching on them. The nankhatais will be soft initially and taste like pedas. Gradually, they will become crispier. Take ghee and sugar in a bowl and beat them well until fluffy and creamy. Add powdered elaichi and mix well. In a different bowl, mix besan, suji, and baking powder. Suji is optional and is added for crunch. 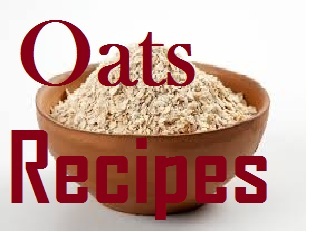 Now combine wet ingredients with dry ones. No need to knead the dough like chapati dough. Just gather the ingredients well. If the dough feels dry, add little more ghee. It should be like smooth, soft dough, which is easy to be rolled into balls and does not break. Make lime-sized balls and press little with your palms. If you want, you can insert almonds or pista in the cookies, as shown in the pic. Place nankhatais in a baking tray and refrigerate the dough for 30 minutes. Meanwhile, we need to preheat the oven/cooker for 10 mins. Take an iron skillet (tawa), and place a cooker on it. Place a wire rack inside and switch on the flame. Take out the steel/baking tray from the refrigerator and keep inside the cooker. Keep on medium flame for 12-15 minutes. Check after 10 mins. If needed, keep for 5 mins more. Small cracks will start to appear on the cookies. That's it! Turn off the flame. Let them cool and take them out on a cooling rack. Make sur eyou do not burn your hands taking the chickpea gluten flour cookies out. This batch will stay fresh for a week. But I seriously doubt it will disappear soon. If you want to bake in microwave, preheat the microwave for 10 mins. Then turn on the convection mode - 180 degrees for 10-12 mins. Check after 12 mins. If needed, keep for 5 mins more. 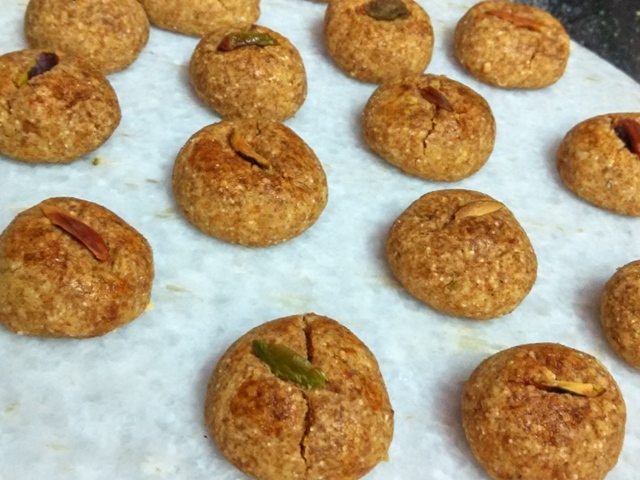 Your besan nankhatais are ready to be savored. Enjoy this traditional delicacy. If you love besan, you are almost sure to fall in love with this unique chickpea biscuit recipe dished out with cornflakes. The unique besan-cornflakes combination tastes havenly. Try it once.